7:00 p.m. $6/person with bottomless popcorn! 4:00 p.m. $6/person with bottomless popcorn! The Pirates of Penzance (PG) 4:30 p.m. 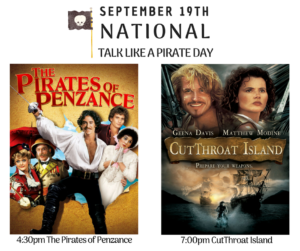 CutThroat Island (PG-13) 7:00 p.m. $6/person with bottomless popcorn! 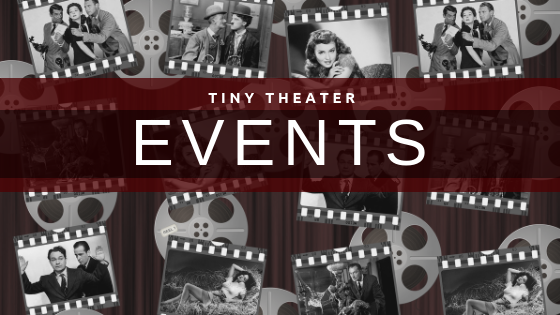 Two showings! At 4:30 p.m. then again at 7:00 p.m.
2:00 p.m. $6/person with bottomless popcorn! 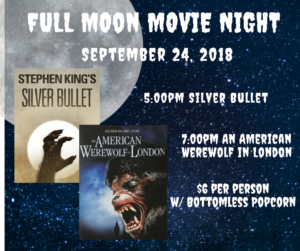 Silver Bullet (R) 5:00 p.m. An American Werewolf in London (R) 7:00 p.m. $6/person with bottomless popcorn! Fun movies to watch when the kiddos get out of school early! 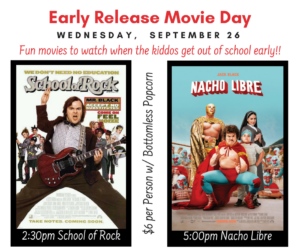 School of Rock (PG) - 2:30 p.m. Nacho Libre (PG) - 5:00 p.m.